A staple in my everyday routine. I do prefer the normal above the whitening. Whitening tooth pastes are not the best option when you have sensitive teeth and brush your teeth 4 times a day. It dries out the corners of my mouth. My powder foundation since years. Absolutely love it, have switched to NC20 though because it fits my current skin tone better. The coverage is amazing. You can use this on your own or for extra coverage to set the liquid foundation with. Contains green tea and 70% aloe vera concentrate. A great day and night cream for sensitive mixed skin. Gets absorbed by the skin really well and doesn't leave a sticky layer. Great make up remover for waterproof make up. I have switched to Maybelline at the moment because my current mascara needs something stronger. This shampoo smells like the typical green soap my grandmother had in her bathroom. You love or hate it. It cleans the hair thoroughly and the scalp a bit too much. I found it to dry out my scalp and that happened every time after I used this shampoo. Won't get it again. A great conditioner without paragons, petroleum, mineral oil or artificial colors. It is quite pricy, especially if you have long hair. The scent is amazing. The packaging is a disaster. It is super difficult to open when your hands are wet. I don't like twist caps at all. This have been my savior during the super hot summer days. Swelling up like a balloon is no fun. I used this for cooling my body down. You can also use it after you've saved or after a sun burn. I just needed to cool down my inner oven which suffered a lot this summer. Thanks to Kryolan I had more options to keep my cool. This skin refreshing spray is super great to wet pigments, or the aqua colors. If you want to get rid of the powdery finish of your make up, it makes it look more natural. If there something I hate about summer, is to lather on the sunscreen. This is an amazing product. You don't need to use your hands anymore, you can just spray it on. The mist reminds me a lot of the Avene and Kryolan face mists. Super fine and very effective. Unfortunately it is only available in the USA. I will be stocking up on these babies next time I am in America. Another great option for people that don't like to mess around with lotions. This one still needs some rubbing after spraying it on, but it is not super sticky and has a pleasant scent. Bought this one in the Netherlands. This is supposed to be a great dupe for the Bioderma Crealine/Sensibio. It can be cheaper than the Bioderma Sensibio if you don't buy the two pack in France. I always get my Sensibio when I am in Paris and get the double packs. L'Oreal did a great job with the Hydra Active 3, but I still prefer the Bioderma since this product will empty super fast. For traveling I would prefer L'Oreal, but I have been filling up traveling sized bottles with my Sensibio for years now. If you can't get your hands on the Sensibio, this is a good alternative with the same result. It's great for sensitive skin, doesn't irritate and get's rid of most of the make up (non waterproof) really well. I still always wash my face with a face wash after I've taken off the make up with the fluid and cotton pads. Das Kerastase hab ich auch grad leer gemacht. Den Geruch mag ich, aber die Pflegewirkung ist nicht sehr gut, das stimmt. 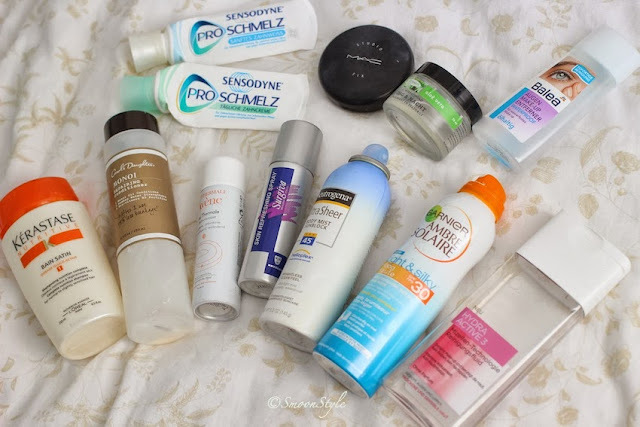 Was die Sonnencreme von Neutrogena angeht, beneide ich die Amerikaner. Die haben da echt tolle Produkte und teilweise ja auch LSF 90-100. Fürs Gesicht habe ich sie perfekt Creme mit LSF 50 gefunden. Hasse das Geklebe am Körper auch total. Hi Simone! I would like to know what beaty products are you using for your skin with the pregnancy and the recovery. I know, mum need extra cares to recover the beauty of their skin. You often write about different shampoos and I'd like to ask you how often do you change them? Or do you change them every time you wash your hair? I'd be happy to mail you a package - just email me your list!